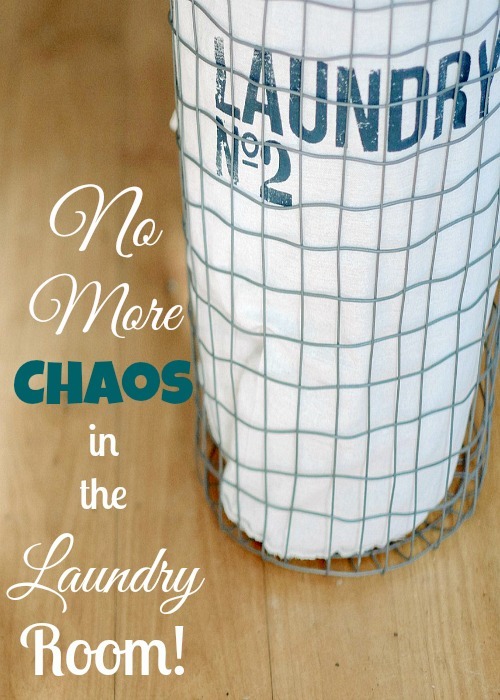 How To Declutter Clothes & Chaos In Your Laundry Room This Week! When asked what room gets you in a tizzy (the kitchen and dirty dishes won 1st prize last week! ), y’all said that you want to know how to declutter clothes and the chaos in the laundry room. All the ladies said, “Oh Yeah!” Not only are we going to get a grip on the dirty clothes piles, we’re going to whip our laundry room into shape and make it cute (on the cheap) so that we want to spend time in there! But first, I recorded this morning to show you real life in action and how I’m not perfect either ….. In a second, we’ll get down to the business of working on our laundry room but read this post before we go any further so you will know what hacks and original video I was talking about ->>> How to Rock laundry duty to keep it from taking over your life. I’m right there with ya, sister, but this must be done. Get a container to put smaller items in and a designated area to put the junk stuff. Set your phone timer for 30 minutes and let’s remove as much as we can in that time frame from the laundry room. If you have clean clothes in the laundry room, put them on your bed (this will force you to put them up before sleepytime happens). If you have dirty clothes in the laundry room, put them in a container outside of the laundry room for today. What has been working efficiently in here? What takes too much time that I need to fix? What gets me stressed out the most in here? Does your dryer have a buzzer to let you know when to come take out the clothes so they won’t be wrinkled? If not, do you have a loud buzzer to let you know? Do you have a place to fold and hang clothes on hangers? Having a folding station and hanging station are essential to easing my laundry nightmares. Also, as soon as the dryer starts making noises to alert me that the dryer is done, I act like a crazy woman to get to the laundry room to avoid wrinkled clothes. It works, though – I rarely iron anything! Seriously, fold and hang up your laundry before it leaves the laundry room and it will be life changing. No more laundry baskets full of wrinkled clothing!!! Alright honey, take just a couple days to get these two missions completed and we’ll chat later this week about the fun part: gadgets to make your laundry room work better for you and how to make it so beautiful that you don’t mind the work! It just takes intention – let’s simplify life together! Let’s connect on Facebook or Instagram. I’ll be asking how you are doing on your Laundry Room Challenge & sharing photos of how I’m doing over here — so look for me! Oh yeah, when you finish your challenge each day this week, you have my permission to eat a cupcake! Ready to declutter clothes and chaos this week? How to Snag the Perfect Family Getaway! (Intro) Feb. Challenge for Wives to Shop Your Pantry! How to pick your WifeLife theme and have the best year! Ultimate Cool Movies List the whole family can enjoy together! Next Post How To Make Your (Organized Chaos) Laundry Room AMAZING This Week! Love this! Great guide to declutter! This is something I totally need to work on. We just remodeled our laundry room, so it looks great now, but getting myself to actually fold the laundry when it comes out of the dryer is a challenge. I totally need to start doing it as soon as it comes out of the dryer! Love love love this post so much because it’s almost that time of the year: SPRING CLEANING! Out with the old, in with the new. Thanks for the inspiration! Great tips. Decluttering feel so good. These are some simple, practical helps that I needed! I see the mess and just get discouraged and let it pile up! This definitely inspired me to declutter my apartment this weekend. I have been needing to but get so overwhelmed. Thanks for the tips. We’re in the middle of moving soon (remodeling now) and so it all feels like chaos. Haha, I need to declutter and plan my new space! It’s like you knoew this has been bugging me! haha! I started decluttering last weekend, but still have more to do! This is so helpful, especially if anyone’s like me and the laundry room is a small area… it can quickly become cluttered and overflow into our kitchen! I’ll def be implementing these into my spring cleaning routine this weekend. Thanks for sharing! Love this…except for the moving every single thing part…sigh…so much work to do! I’m in the process of decluttering my clothes, I have so many sweaters from when I was a teen, from my grandmother who passed away, things that don’t fit anymore. You’ve given us such a detailed process to follow. Thanks! We have started doing daily laundry at our house and it’s a total game changer. I love staying on top of it. 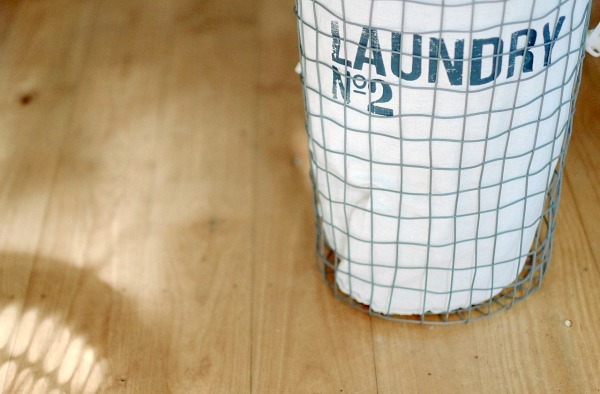 Great tips, love your laundry basket! My laundry room is TINY and it doubles as a mudroom, so I’m always a little lost as to how to really make it function efficiently. But, I have found that getting the laundry OUT of the laundry room is a big step. I totally put it on my bed so I have to fold it before bed. Bonus, my kind husband will often help me fold while we relax and watch a show together in the evening. I love this! I like how you break it down and set the timer. It makes it seem more doable! Love the bed strategy, as I’ll let clean laundry sit on my closet floor for a few days before dealing with it. I finally have a closet inside my laundry room, which has made life so much easier! I absolutely need to try this! My laundry room is my nemesis! I hate laundry so much!! A few weeks ago I decluttered and got rid of clothes. I think I had 5 boxes of clothes that were in our rotation that we did not need!! I’m getting to the point where I just want to toss 90% of the close in our masters closet. It seems like we make the most laundry mess these days. Good tips you shared above! I definitely need to implement these steps in my own home. Thanks for sharing. For every single mom I know, the laundry room is total chaos! These are great tips, and I need to implement some of them right away! Thanks for a great post! I really have to get to decluttering my clothes AND my son’s clothes, he has so many things that just don’t fit him anymore, he’s growing like a weed, LOL. I need a dryer buzzer in my laundry room! It might sound dumb, but I never thought to just put a standalone timer in there myself. I just kept thinking I needed a new dryer that had one installed already. Haha. Thanks for the tips! Pingback: How To Make Your (Organized Chaos) Laundry Room AMAZING This Week! Well I gotta start decluttering clothes, this helps many! Thank you.